Venture to the small island of more than 30 waterfalls. Enjoy the teeming marine life and picturesque islands of Sambawan, Dalutan and Capinhan. Join us on our 4 days 3 nights photography tour on Biliran island. Only 8 slots are available. Kindly send us a private message for the rates if you are interested. Participants meets up at Daniel Z Romualdez Airport in Tacloban. We leave at 9am for Biliran. It is important for participants to get the morning flights. In Biliran, we travel to Almeria. From Talahid Beach our boat will take us to Sambawan Island where we’ll spend the night there for photography. Early morning shoot at Sambawan. Mid-morning we head back to Almeria and stop by two islands, Dalutan and Kapinyahan. Check in at the resort and we’ll visit one waterfall in the afternoon. Sunset at Talahid Beach. Whole day will be spent chasing waterfalls and visiting other interesting sites in Biliran. Morning will be a free day for participants. We’ll also close the event with a little program. From Almeria we head back to the airport in the afternoon for our respective flights. What is the level of fitness required to join? Are there extensive trekking involved? While participants of any fitness level are welcome, we do recommend preparedness as there will be some hiking involved. The difficulty is from easy to moderate with hike durations from 30 minutes or more depending on the pace. Do I have to be a professional to join the tour? Any one is free to join as long as you are enthusiastic about capturing stunning images for this trip. Whether you shoot using a DSLR, compact camera system, point and shoot or even smartphones, you are welcome to join. Rest assured your skills and knowledge will expand in this photo tour. I don’t want to share the room. Can I have the room on my own or share with my special someone? The price is based on triple occupancy. We cannot guarantee individual rooms for individual or couples as there are only limited rooms available. If ever we find a room, there will be additional charges. We accept payment via bank deposit through BPI and BDO. Details would be sent to you once you register on our interest list. Can we extend our stay in Biliran or Tacloban? Participants are free to come in early or extend their stay in Tacloban or Biliran at their own expense provided they join the activities during the tour. Something came up and I can’t join the tour. Can I refund? Deadline for registration is February 24, 2017. First-come, first-serve basis. Payment details will be sent to you once you have submitted the registration form. Join our 2-island Photo Tour and Workshop. If you are interested, you may sign up here and we’ll send you rates, details, itinerary and payment options. Participants meets up at Basco Batanes airport. We’ll check inn at our hotel, rest and have a lecture in the morning. In the afternoon we’ll start our photography tour north of Batan island. Early wake-up call as we catch the boat to Sabtang Island. We’ll do a tour of Sabtang. Sunset shoot at Nakanmuan and spend the night at Chavayan. Option for night shoot or star trails. Sunrise shoot at Chavayan. A little beach time at a secret beach before heading back to Batan Island. We’ll head back to the hotel to rest and in the afternoon, we’ll do another round of sunset shoot at Chamantad. An optional night shoot at Tayid lighthouse. We rise early for a sunrise at Valugan beach and do a southern tour of Batan Island. Possible free time in the afternoon for participants to shoot at their own pace. Closing program. We fly back to Manila. Is the flight inclusive in the photo tour fee? Our photo tour fee does not include flights. We like to give our participants to book on their preferred airline and dates as long as they fit in our itinerary. We can also book the flight at your convenience and add them up to the photo tour fee. While participants of any fitness level are welcome, we do recommend preparedness as there will be a little hiking involved but nothing too difficult. The price is based on triple/quadruple occupancy. We cannot guarantee individual rooms for individual or couples as there are only limited rooms available. If ever we find a room, there will be additional charges. Can we extend our stay in Batanes? Participants are free to come in early or extend their stay in Batanes at their own expense provided they join the activities during the tour. Deadline for registration is March 17, 2017. First-come, first-serve basis. Payment details will be sent to you once you have submitted the registration form. Happy Heads with the Headware in Batanes! We just concluded our Backpack Photography Photo Tour Batanes last Holy Week and under the sunny and windswept landscape of Batanes, Backpack Photography is thankful to The Headware for providing each of the participants a Headware they can use. Strong winds? No problem! As the headware is tight and secure enough to fit anyone’s head where an occasional cap would easily be blown out. Some girls used it for hair protection to avoid it getting sticky from dust after a long day’s journey. I for one is happy to keep the beads of sweat from trickling down my face while hiking. It can also be used to wipe out some dirt on our lenses from occacional salt water splashes. It’s a very versatile outdoor wear! Grab your backpack & go! Now’s a good time to plan your out of the ordinary trips! 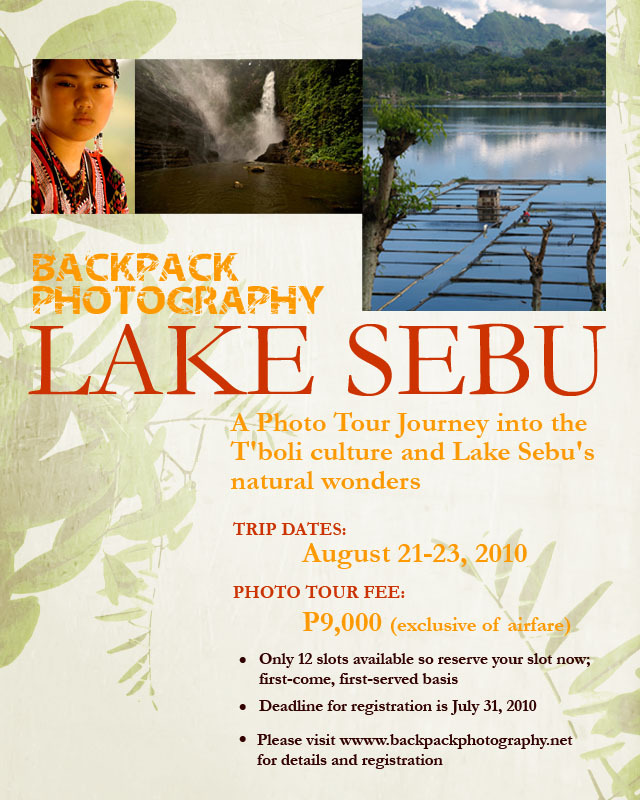 Backpack Photography announces its schedule of photo tours and workshops for 3rd and 4th Quarter of 2010.